What a championship game to close out a season, it had everything you would want, raging 100 degree temperatures, amazing catches, close outs, Home Runs, and a tie going into the last inning. This is what us true kickballers live for people. In the 7th with a tie the Nerds batted first. With a miraculous display of team work they were able to squeeze out 2 runs to go up. Don't get ahead of your self though, they still had to take the field....but..1..2..3..Were champs. This game was a good reminder, always bet on the Underdog. Way To Go Nerds. Knowing that they needed two big wins to earn the title of Colonel Summers Champs, the family that is Ball in the family came ready to compete. In the semifinal game, they proved that they belonged in the championship game with an explosion of firepower that gave them the most runs they had scored all season and resulted in what some members of the team considered the best game they had played all season. With their ticket to the championship game punched, Ball in the family was able to celebrate for what seemed like a solid two seconds before having to re-enter that mindset that earned them their first win of the day. 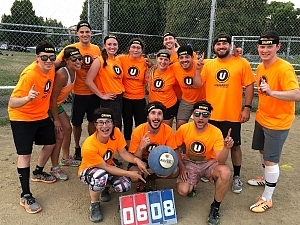 They matched up with a competitive IDS Summer Kickball team that had time to scout and prepare for them while watching the end of the semifinal game prior to theirs. Come game time, you could tell it was going to come down to the final inning and sure enough, it did. After trading leads all game and staying within 4 runs of each other throughout the course of the game, Ball in the family found themselves up by 1 at the top of the 7th, fielding with a chance to seal the victory. 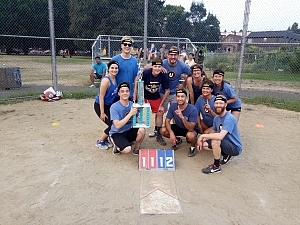 With 2 outs in the inning, a strike on the count, and runners in scoring position at 2nd and 3rd, IDS Summer Kickball had a chance to take the lead and give themselves a shot at winning it all. The pressure, the anticipation, and the attention on what would be the final pitch of the game was nothing short of incredible. As the pitch crossed over the right side of the plate and the kicker's foot made contact, the usually jubilant crowd was silent. As the ball lifted into the air towards shallow right center, the center fielder and second basement for Ball in the familyran towards its landing spot seemingly destined to collide. Right before the came together one jumped out the way of the other creating just enough room for a juggling, game sealing catch for the third and final out of the game.